This article is reproduced from the May 2010 blog post by Spring Gillard on the Compost Diaries: The Conversation Continues website. It first appeared in the spring issue of BC Organic Grower Magazine. As a child, Steve Easterbrook and a friend paid regular visits to a neighbour up the street in rural Burnaby; the sometimes grumpy old man had an aviary. In spite of being a grump, he let the kids hang around and showed them the ropes. 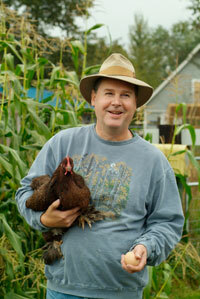 He raised traditional heritage breeds like Rhode Island Reds and Black Jersey Giants. 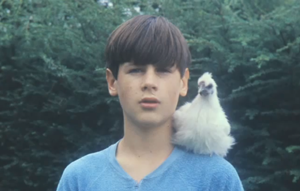 It was before battery houses came into vogue in the late 1960′s, free range was still in existence,” said Easterbrook..
Those visits sparked his lifelong passion for poultry and deep interest in the avian world. At only eight years old, Easterbrook and his friend were tending their own flock of free range chickens, providing eggs for their families and neighbours. Thirty years later, Easterbrook bought eight acres of farm land in Richmond on the Fraser River. After some market research, he discovered that no one was selling certified organic eggs anywhere in Canada. He approached the British Columbia Association for Regenerative Agriculture (BCARA) to suggest that they work together to establish some regulatory standards. They gave him some California standards to guide him in the meantime. He built a barn, purchased a small flock of poultry and was off and running. Well sort of. He hit a pretty big glitch when he contacted the BC Egg Marketing Board (BCEMB) and learned about the quota system. And so ensued a long and drawn out struggle to help establish the organic egg industry. Other organic egg producers were involved over the years and each played a significant role in the development of the industry. The markets have changed a lot since the inception of the boards, especially with the rise of organics, but the marketing schemes have not. It would have cost Easterbrook about $70 a bird to buy quota. In 1994, Easterbrook opened up outside of the system initially with 300 hens and sold his organic eggs to Circling Dawn, an early “health food” store in Vancouver. The customers loved the eggs. After some tweaking of the organic feed with supplier (and another organic pioneer), Rod Reid, production was ramped up and he was off to the races. Well sort of. Then two BCEMB inspectors showed up on his farm and started counting birds. The man said, “You have to have quota or we’ll shut you down”. A few days later Easterbrook received a letter informing him he was operating illegally. They also stapled a seizure notice on his barn. He never saw it though, because the chickens ate it. Only staples and bits of paper remained. The inspectors had posted the notice within beak reach. “They obviously had no idea how free range chickens behave,” he said. He couldn’t afford a lawyer, but with the help of a law librarian, he managed to file an appeal. He also launched a customer campaign that resulted in a flood of faxes and a petition sent to the BCEMB and the Ministry of Agriculture. Easterbrook took an educational approach during his appeal. He delivered a presentation on the health and environmental benefits of organic eggs. He encouraged them to see this as a market opportunity. “Trying to shut organics down was contrary to their purpose as an egg marketing board,” he said. They agreed not to shut him down, if he agreed not to expand. But ultimately, he had to bite the bullet and buy the quota. He considered it a necessary evil. The industry continued to struggle and there were on-going legal battles. Easterbrook just kept his head down and worked quietly behind the scenes, lobbying for a new entrant status and program. The day I phoned him, he was celebrating. He had just heard that the BCEMB was finally implementing a program; four new organic egg producers with 3,000 birds a piece would be grandfathered in to the system each year in a lottery. Today, Rabbit River Farms is certified by the Fraser Valley Organic Producers Association (FVOPA). A staff of eight tend to five thousand layer hens, producing 4700 eggs a day that are then sold in stores throughout BC. 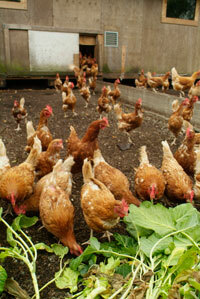 Chickens range in a lovely organic pasture and dine on certified organic vegetarian feed. “Livestock are free to maintain their normal social order. They can move, interact, dust, scratch, peck,” he said. He calls it “freedom farming”. Easterbrook’s new state of the art “translucent” barn is in full operation now too. It has an egg grading station and a three level open nesting system with manure belt. Birds can walk around, roost, perch, water and feed comfortably in a naturally, daylighted environment. An Earth Bin composts the chicken manure. Easterbrook has applied for farm gate status and hopes to soon be selling eggs, heritage poultry breeds, and a chicken manure based fertilizer and soil mix on site. The organic egg business is hopping along nicely now. And so to the catchy name. “It’s a play on my last name,” says Easterbrook. And the farm is on, well, not a brook, but a rather mighty river.